NEWINGTON, N.H., (February 1, 2019) – The SIG SAUER ROMEO4T is the ultimate red dot sight for fast accurate target acquisition in all lighting, weather, and terrain conditions. 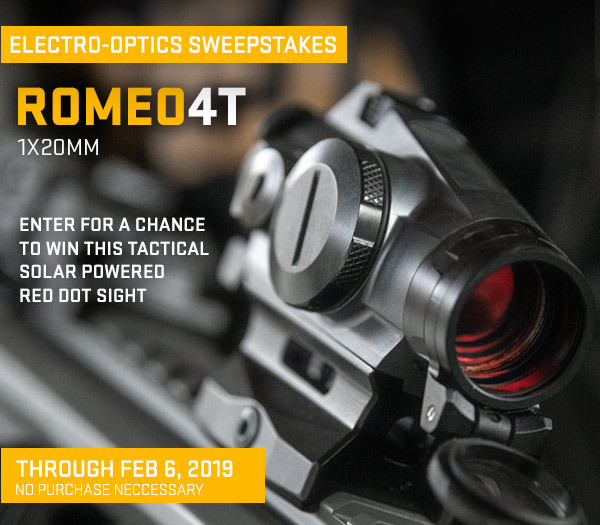 Register today in the ROMEO4T Sweepstakes for your opportunity to win the sight used by elite government and military agencies by visiting sigsauer.com/promotions now through Wednesday, February 6, 2019 to participate in this promotion. The ROMEO4T features 1x20mm zoom capabilities with four different integrated reticle options to choose from, MOTAC (Motion Activated Illumination), and a runtime in excess of 100,000 hours with solar and battery usage. The optic is waterproof and fog proof (IPX-8 rated), housed in a strong, lightweight CNC 7075 aluminum housing, and is designed for semi-automatic pistols, MSR platforms, and shotguns. There’s no purchase necessary to enter. For full contest rules, terms, and conditions visit sigsauer.com/promotions.